Seated, from left: Megan Campbell, Bruce Jacklin, Kathy Sturm and Karly Jacklin. Standing: Cate Blair-Wilhelm, Megan Evans, Abigail Tayse and Jennifer Walters. This wildly comic and sometimes touching play features Jake’s flashbacks about the women in his life – that are occasionally interrupted by the actual women. Jake’s women include a revered first wife, Julie, who died years earlier in a tragic accident; his daughter, Molly, who is recalled as a child but is now a young woman; his boisterous and bossy sister, Karen; an opinionated analyst, Edith; his current wife, Maggie, who is contemplating her future with, or possibly without, Jake; and the newest arrival, Sheila, a woman who just may be part of Jake’s future. 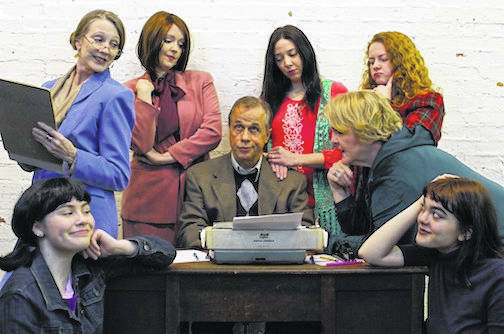 The cast features Bruce Jacklin as Jake; Megan Evans as Maggie; Kathy Strum as Karen; Megan Campbell as young Molly; Karly Jacklin as older Molly; Cate Blair-Wilhelm as Edith; Abigail Tayse as Julie; and Jennifer Walters as Sheila. Veteran actress and MTVarts board president Susan Moreland directs the show. She notes that “Jake’s Women” is considered one of Mr. Simon’s hidden gems and that the cast for this production is proving very talented at juxtaposing moments of high comedy and high drama. Other members of the production team are set construction Joe Bell, Lighting Designer Ian Ernsberger, and Sound Designer Rodney Cheek, Costumes are Megan Evans, light and sound operator is Scott Swingle and the stage manager is Kyle Boucher. Show dates are April 5, 6, 19, 20, 26, 27. Social hour is 6-6:30 p.m. and dinner is 7 p.m. and the play begins immediately after dinner. The dinner menu has expanded by adding Atlantic Salmon as an option. For complete menu selections and pricing visit the website at alcoverestaurant.com.